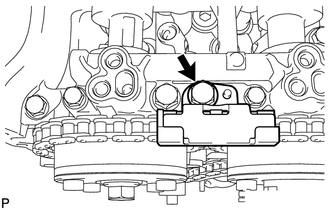 (a) Remove the engine and transaxle (See page ). (a) Remove the exhaust manifold converter (See page ). (a) Temporarily install the crankshaft pulley bolt. "A" is not a timing mark. 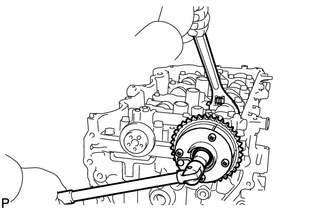 (b) Rotate the crankshaft clockwise so that the timing marks on the crankshaft timing gear and camshaft timing gears are as shown in the illustration. 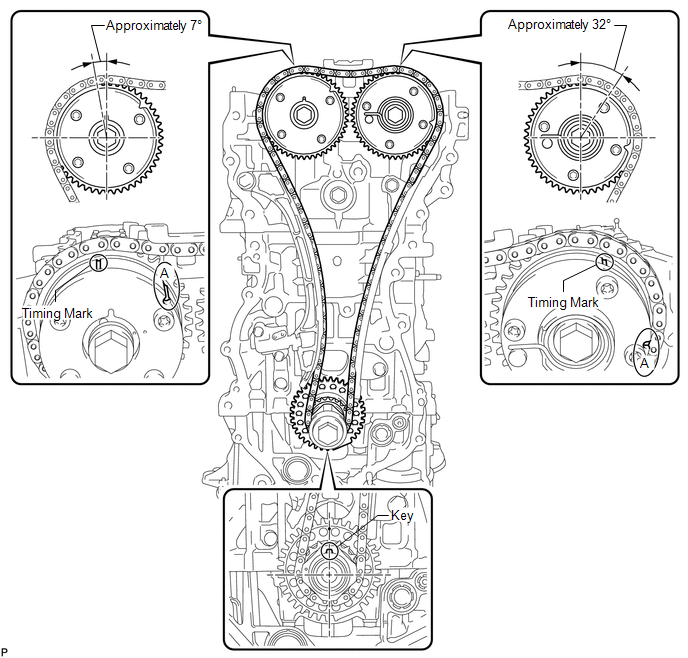 If the timing marks do not align, rotate the crankshaft clockwise again and align the timing marks. 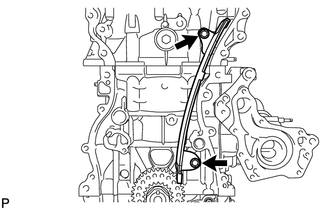 (c) Remove the crankshaft pulley bolt. (a) Remove the bolt and timing chain guide. (a) Allow the plunger to extend slightly, and then rotate the stopper plate counterclockwise to release the lock. Once the lock is released, push the plunger into the tensioner. (b) Move the stopper plate clockwise to set the lock, and insert a pin into the stopper plate hole. (c) Remove the 2 bolts, chain tensioner and gasket. (a) Remove the bolt and chain tensioner slipper. (a) Remove the chain sub-assembly. (a) Remove the 2 bolts and chain vibration damper. 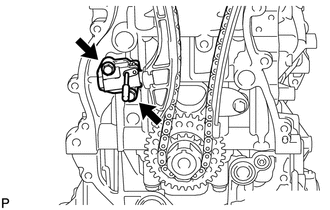 (a) Hold the hexagonal portion of the camshaft with a wrench and remove the bolt and camshaft timing gear. 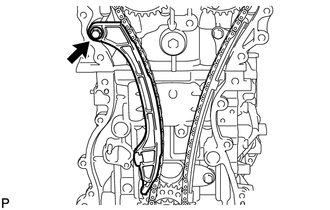 Be careful not to damage the cylinder head or spark plug tube with the wrench. Do not disassemble the camshaft timing gear. 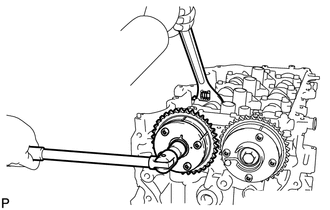 (a) Hold the hexagonal portion of the camshaft with a wrench and remove the bolt and camshaft timing exhaust gear. Do not disassemble the camshaft timing exhaust gear. 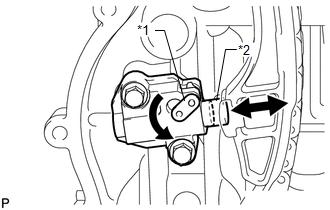 (a) Uniformly loosen and remove the 20 bearing cap bolts in the sequence shown in the illustration. 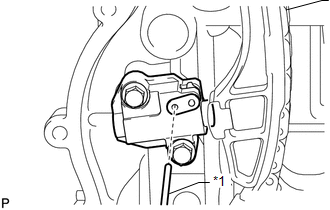 (b) Remove the camshaft housing by prying between the cylinder head and camshaft housing with a screwdriver. Tape the screwdriver tip before use. Be careful not to damage the contact surfaces of the cylinder head and camshaft housing. 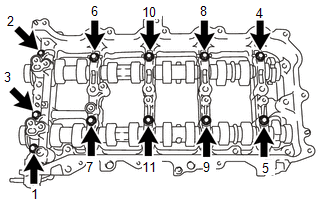 (a) Remove the 11 bearing cap bolts in the sequence shown in the illustration. (b) Remove the 5 bearing caps. Arrange the removed parts in the correct order. (a) Remove the No. 1 and No. 2 camshafts. (a) Remove the 16 valve rocker arms from the cylinder head. 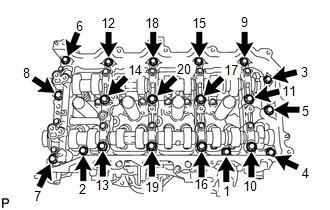 (a) Remove the 16 valve lash adjusters from the cylinder head. 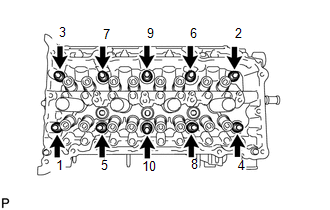 (a) Remove the 16 valve stem caps from the cylinder head. (a) Using a 10 mm bi-hexagon wrench, uniformly loosen the 10 bolts in the sequence shown in the illustration. Remove the 10 cylinder head bolts and plate washers. Be sure to keep the removed parts separate for each installation position. Be careful not to drop washers into the cylinder head. Head warpage or cracking could result from removing bolts in an incorrect order. (b) Remove the cylinder head. 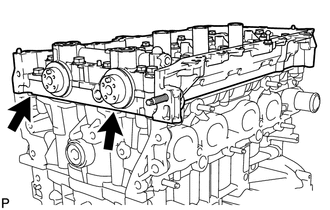 (a) Remove the cylinder head gasket from the cylinder block.